Military Monday: John B Armstrong, Civil War Veteran or Not? 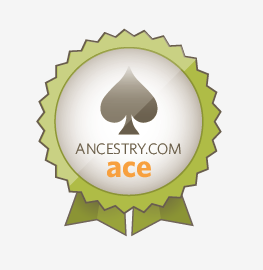 I am unsure any of ancestors fought in the Civil War. Which seems strange, since many of my ancestors resided in the United States during the war. I have uncovered evidence that two of my relatives took part in the Civil War Battle of Portland, Maine which I blogged about in a previous post. I don't believe either of those relatives were active military. However, I have reason to believe that my 2nd great grandfather, John B. Armstrong, was a veteran of the Civil War. While researching some cemetery records, I found the plot record for the Armstrong gravesite in S. Portland, Maine. The plot record indicated that John B. Armstrong was a Civil War veteran. This notation was probably useful when they put out flags for memorial day and/or veteran's day. The only problem is that when I have conducted research on John B. Armstrong's participation serving in the Union Army in the Civil War, I wasn't coming up with any records which show in what capacity he served in the war. for John H. Armstrong with the same date of death and in the same Armstrong plot as my ancestor. This looked promising and it was understandable that the person who created the record may have made an error on this cemetery record between John B and John H Armstrong. What was exciting was the record showed that John H. Armstrong had served in the Maine 7th infantry regiment, company G. Enlistment date was listed as August 21, 1861. He had entered as a private and was discharged as a sergeant. So there you go. John B. Armstrong, Civil War veteran. The thing is that I didn't stop there. I could have been satisfied to know that my ancestor was a veteran, but I went on to research the regiment to see if what I could find about their history of battles. Also, I looked for more Civil War records that might show my ancestors role and involvement in the war. 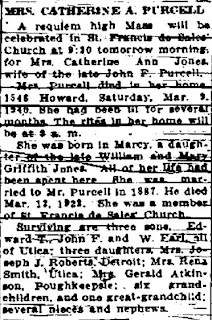 Maine has such a wealth of genealogical records online, but they haven't made the Civil War records searchable, but I did find the records on familysearch.org. The military records are under the Maine, State Archive Collections, 1718-1957. Once you are under the archive collection, don't look at the individual Maine county records. The civil war records AREN'T there. They are under the first option "Maine". Click on Maine and you will be able to select Military Records-Civil War. From there you can browse records by the different Maine regiments and companies. You have to review them one by one to find the records you are looking for. Luckily, I knew the regiment and company and date of enlistment...so that should make it easy to find the records I was looking for. Which caused a problem. I found the Enlistment Rolls, which includes the new recruits. There is no listing for a John B Armstrong from Cape Elizabeth, Maine, but there is a John H. Armstrong from Portland, Maine. Other records for John H. Armstrong for this regiment and company indicated he was born in 1838...my ancestor was born in 1822. The discrepancies were adding up. I suspect that there really was a John H. Armstrong and my ancestor was getting confused with his military records. The last indicator that lead me to this conclusion was the US, Civil War Draft Registration, 1863-1865 on Ancestry.com. The draft record indicated John B Armstrong of Cape Elizabeth, Maine eligible to be drafted in June 1863. Seems very unlikely that an active military personnel would be listed as eligible to be drafted. Did my ancestor, John B. Armstrong, serve in the Civil War? I still don't know, but I feel confident it wasn't with the Maine 7th Infantry. Ok, ladies I have a question for you. Would you ever marry your brother-in-law? If you would, I suggest you not tell your husband. It would likely start a nasty fight. This is the story of two brothers: Stefan "Steve" and "Nat" Gula and "their" wife, Maria "Mary" Smey. These two brothers are my great grand uncles. Steve and Nat were born in the small village of Wolowiec in present day southern Poland. Records show that Steve was born on November 10, 1880 and that Nat was born about 1891. Mary was born about 1883. I am not sure where Mary was born, but likely she was Rusyn and was born close to where the Gula's originated. Steve immigrated to the US in 1899. His original destination was listed as Cleveland, OH. Not clear how long he spent there, but he did eventually return to Wolowiec for a time. 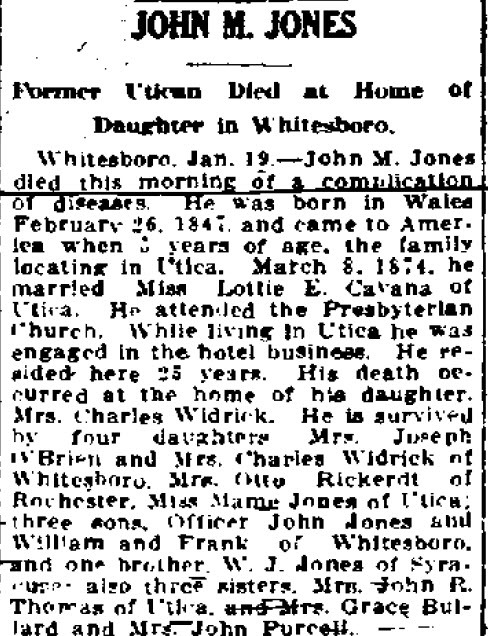 He married Mary sometime prior to 1907 and returned from Wolowiec on August 14, 1907. He and Mary lived for a time in Ansonia, Connecticut. Steve and Mary had 5 children: John "Iwan", Peter, Joseph, Michael and Stephen. In the 1920 US Census, Steve Gula is listed as an invalid. He died on December 6, 1921. In a death notice it states he was ill for 8 years prior to his death and died when only 42 years old. When Steve Gula died all of his children were all still quite young. I am sure his death was a devastating blow to the family. In the 1920's it would have been very difficult for a woman with small children to support the family. Even prior to Steve's death things must have been tough financially. 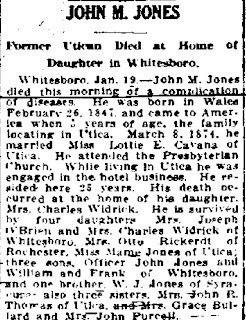 Steve and Mary's oldest son, John, had been living in Wolowiec with an uncle (Teodor Smij) since he was an infant. John would have never really known his father as he didn't return to the US until after his father died. Also, since Steve had been unable to work they had taken on 4 or 5 boarders (according to the 1920 US Census). On Nov 24, 1923, Mary Smey Gula remarried Nat Gula. There was obvious financial need for her to remarry and to do so quickly. But did they fall in love? Did Nat feel a responsibility to support his sister-in-law and nephews? Was there some necessity? Nat Gula and Mary had at least 4 children of their own: William, George, Harry and Mary. Mary died March 23, 1936 at only 53 years old. Nat lived to be 71 years old and died October 27, 1962. When I started my research into the Gula brothers which included my great grandfather, George Gula, I had no idea about the Steve and Nat "sharing" a wife. 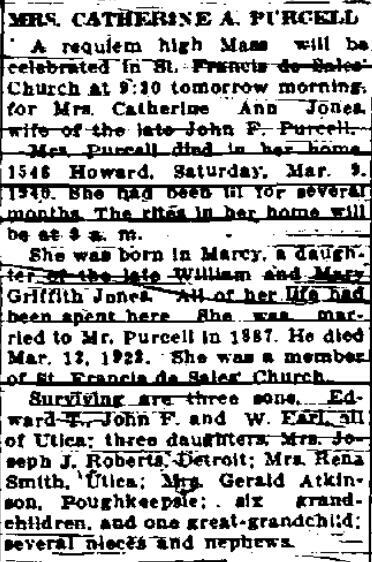 When I found obituaries from Steve and Nat's children I was getting confused because they all mentioned Mary as their mother, but the names of the father would differ. I had thought this was some sort of variance do the americanized name versus the Rusyn or original name. I was quite shocked when a distant cousin corrected me and told me that the brothers had both married Mary. I had never considered that possibility. The realities are that even though the marrying a brother-in-law wasn't common, it may have been a financial and even cultural necessity in some cases. This sort of marriage situation is even addressed in the Bible and is referred to as a Levirate Marriage. This type of marriage is an obligation on a brother to marry his brother's widow. It was seen as protection of the brother's widow and family and was common in tight, close ethnic groups. Sentimental Sunday: Peter Bishop's First Wife - Elizabeth Godfrey? My 5th great grandfather was Deacon Peter Bishop. He was born in New London, CT on August 6, 1735. Around 1755, he married David Godfrey's daughter in Connecticut. We don't know much about Peter's first wife, we are not even sure of her name. 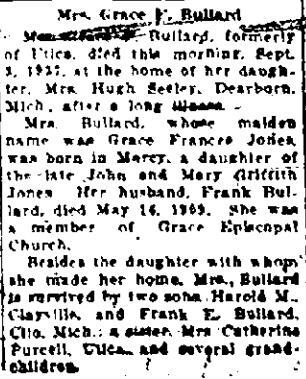 She is usually referred to as "daughter Godfrey" or "[blank] Godfrey". My understanding is that the vital records from New London were lost in a fire during the American Revolutionary War. So we may never know her true name. Her grandmother's name was Elizabeth and it seems likely that she may have been named Elizabeth in honor of her mother. I will refer to her as Elizabeth. In the early 1760's Peter's father, John Bishop was awarded land in Horton, Nova Scotia. He was to be one of the original "Planters" of Nova Scotia. The English had pushed the French out of the area and they were looking to for new colonists to establish the Nova Scotia under British rule. The call went out to the New England states looking for immigrants. Many families from Connecticut took this opportunity to get free or inexpensive land including my ancestors: The Godfrey's & The Fullers. John Bishop came to Nova Scotia with his sons (John, Peter, William and Timothy) and their families. Each was awarded a share of land in Horton equal to at least 500 acres. It is believed that Elizabeth Godfrey arrived in Horton, but died soon after she moved to Canada. I have not been able to find her exact date of death or where she is buried. I am descended from Peter and Elizabeth's daughter, Elizabeth Bishop. She married Noah Fuller. It was important to me to dig into her history and find out as much as I could about her for many reasons, but the one that will resonate with many genealogical searchers is that Elizabeth Godfrey is my link to Mayflower pilgrim, Stephen Hopkins. More about that connection in future posts. Of Peter and Elizabeth's children only Elizabeth Bishop Fuller and William Bishop had children and lived long enough to carry on the Hopkins lineage. 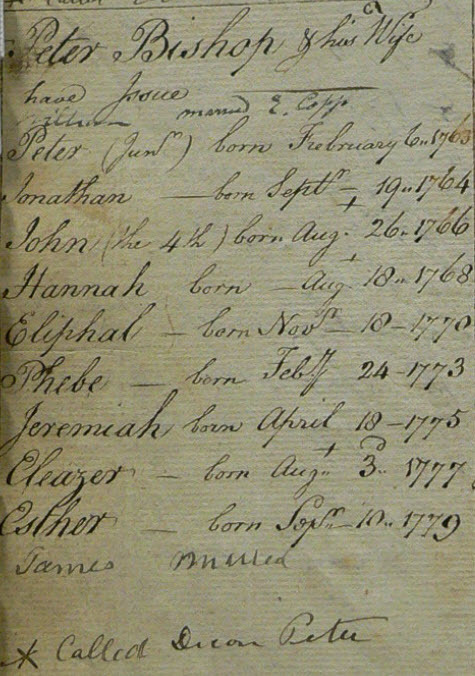 Peter Bishop remarried in 1763 to Phebe Hamilton. Together they had 10-12 children. Below is a the Horton Township record of Peter Bishop and Phebe's offspring. Peter Bishop died April 8, 1825 and is buried in the Old Burying Ground in Wolfville, Nova Scotia (the modern name for Horton Township).